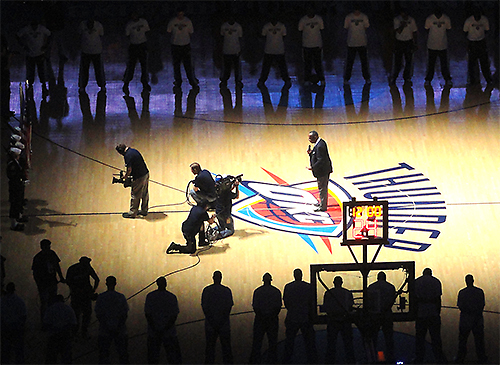 At center court, Bishop Robert Hayes Jr. offers the invocation for "Nothing But Nets Night," April 8, at the OKC Thunder basketball game. Players and a military color guard surround him. Ticket sales topped 600 through the Oklahoma United Methodist Foundation, benefitting the global campaign to eradicate malaria. United Methodists and the NBA are founding partners in the effort. 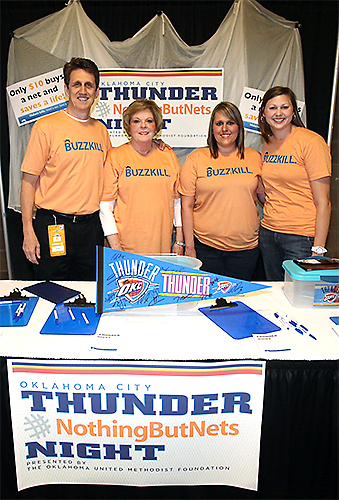 Showcasing "Nothing But Nets" and raising more funds at a booth that night are, from left, David Wiggs, Stillwater District superintendent; Loyce Gandy of the Foundation; volunteer Stefanie Van Nort; and Kristin Van Nort of the Foundation. Funds netted totaled $10,214, and the Thunder beat the Denver Nuggets.